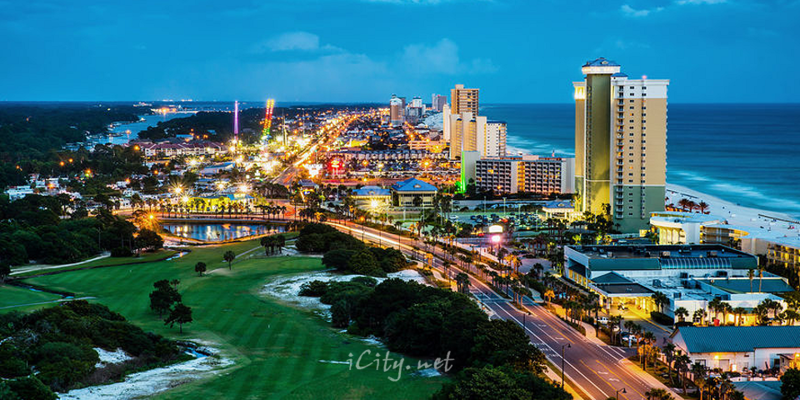 Panama City, Florida is one of the most popular Spring Break destinations in the country. Spring Breakers and thousands of others visit this city each year for its incredible beaches and fun-filled atmosphere. Located on Florida’s Gulf Coast, this seaside community features a host of activities for the entire family. With bright sun-shiny days and over 27 miles of beaches composed of some of the most brilliant white sand in the world, it’s no wonder so many people return here year after year. The beaches are a gateway into a wonderful selection of sea activities including snorkeling, scuba diving, boating, skiing, and fishing. The lucky visitor can even rent a pontoon boat or jet ski for a day of personal adventures on the beautiful waters of the area. It’s an adventure that won’t be forgotten. If you preference is to have someone else do the driving, there are many companies offering glass bottom boat tours. There are numerous state parks and nature preserves, including St. Andrews State Park and Gulf World Marine Park. These parks offer tours and educational resources related to the habitat surrounding Panama City. Beyond the beaches, Panama City offers plenty of entertainment. Several world-class golf courses can be found here, in addition to more than a dozen miniature golf versions. The Ocean Opry Show mixes city life with water life. That mix of city and gulf is also evident at the Museum of Man in the Sea. Several amusement parks compete for visitors’ time, including Shipwreck Island, a popular water themed park. Nightlife in Panama City offers abundant clubs, restaurants for any tastes, discos, bars, and other hot spots. For the young and young at heart, Panama City is the destination of choice for several thousand college students each year during spring break, beginning in late February and continuing through the month of March, but for the rest of the year other visitors come to experience and enjoy its many charms. Families love the abundant activities, both in and out of the water. Panama City’s subtropical temperatures and relaxing Gulf of Mexico waters make this Florida destination a definite must see for anyone visiting the area. Who knows, while taking a leisurely walk along the beach, you might just find a piece of buried treasure or a valuable ancient coin. After all, Panama City’s colorful history includes accounts of real pirates hiding in the deep pockets of the bay lying in wait for the richly laden ships en route to Mexico and Spain. Come and discover this treasure for yourself. Panama City, a Florida playland for all.